Model of Fairey Albacore, using the 1:48 Special Hobby kit, in the markings of L7089, 4-R, 826 Sqdn, FAA. Couple of points of interest for making this particular aircraft: it was based at RAF Bircham Newton, Norfolk, (so local interest to me) where it took off from before being shot down on it’s final mission, and at the time was being piloted by none other than Peter Butterworth who would later go on to find fame in several ‘Carry On’ comedy films, as an actor, during the 60’s and 70’s. The ‘plane was shot down by Bf 109’s , on 21/06/1940, over Texel, Netherlands, where Peter Butterworth had to crash land it on a beach, unfortunately the observer, V.J. Dyke, died of his injuries from the attack, but wireless operator/gunner R.J. Jackson survived along with Peter. They both were taken prisoner. As stated, Peter Butterworth later found fame as a comedy actor, and some of the characters he played were: ‘Doc’ (Carry On Cowboy), ‘Detective Constable Slobotham’ (Carry On Screaming), ‘Citizen Bidet’ (Carry On Don’t Lose Your Head), ‘Brother Belcher’ (Carry On Up The Khyber), ‘Josh Fiddler’ (Carry on Camping) amongst others. Peter also played non-comedy roles too in various films, but was best known for his ‘Carry On’ characters. This is my Tamiya 1:32 F-16CJ block 50. It was painted with MRP paints for the main colours and Alclad2 for the engine – various tones. The Aires resin cockpit was used which is really nice but the instructions for installation are dreadful. Weathering is done with various oil colours and Tamiya Accent Color. February 2010. The aircraft wore a special painting scheme in honour of 20th anniversary of 346 Mira. Here it is my 3rd splinter cammo Viper, this time is the BDU splinter, Tamiya 1:48 OOB, all painted with MRP paints. The attached images are related to the Academy 1:32 kit of F/A-18D which I made recently. This kit has an amazing quality and accuracy. I have spent approximately 100 hours to made it. I just send them to you to make them on-line. Hope you like them. Here’s my model of the F3H-2 Demon made from the HobbyBoss kit. The scale is 1:48 – hope you all like it? This is my second bird from last years “blue phase”. As I already had to mix these curious Japanese blue tones, which are described in the F-2A article elsewhere in the Readers Gallery, I started this Hasegawa 48th scale kit of the F-4EJ Kai in JASDF 8 Sqn service, which was rereleased recently. Besides the Hasegawa kit I used True Details seats, the Wolfpack flaps and slats and Cobra afterburner cans. Otherwise I added the small stripes on the radar nose peculiar to the “Kai” version. The two anti-ship missiles came from the JASDF Weapons set from Hasegawa, whereas the decals are out of the box. And these decals were the only nightmare on this build, as they insisted on silvering. I rarely have such problems with decals in recent years. My system of having a Klear gloss surface and applying the decals also with Klear normally works easy and perfectly. Not so with these Hasegawa “bastards”. I overcame this after making endless small holes in each decal with a small needle and applying Microsoft Sol on each of them. That took several hours/days, but in the end saved the work invested so far. Maybe a F-2 two-seater or a T-4 will follow soon. And another one of my builds! 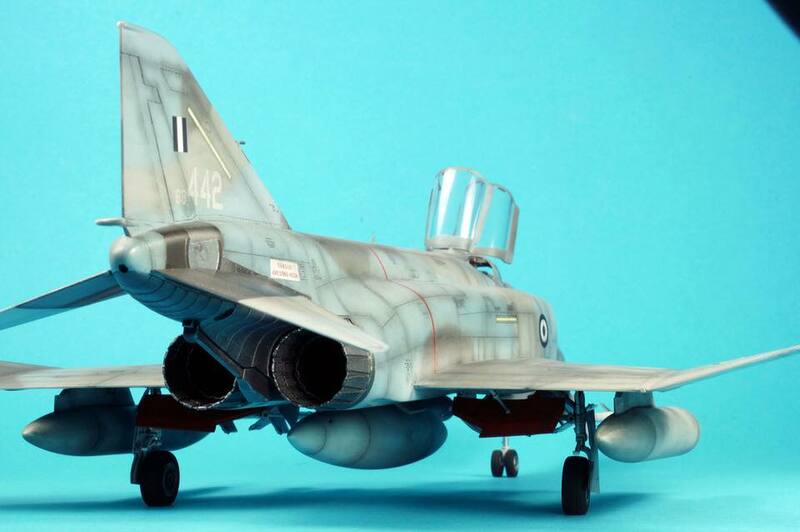 This time it’s a Hasegawa F-4E in Hellenic Air Force trim. I managed to get the Aires cockpit in, which is dreadful and some resin exhausts, also from Aires. The paints used are Gunze and Alclad metals and coats. It´s a refurbished Hasegawa F-4 E with slatted wings. The decals are from CAM pro. Otherwise I did some weathering, added an exercise bomb disperser from a Hasegawa weapons set and a Sidewinder training round. The Sidewinder launch rails are from a Monogram F-4 kit, as they are a better representation of the real ones. Resin seats were also added. The F-4E Phantom is the 1:32nd scale Tamiya kit with an Avionix resin replacement cockpit. The figures came from Verlinden and PJ Productions – the latter was a conversion using kit crew parts and PJ legs. I love the Tamiya Phantom kits – still the only really decent kits in this scale, they aren’t perfect but they fit together better and are most accurate for variants covered. I am “Mehdi Nader”, a professional modeler who is living in Iran, Tehran. a Revell 1:32 F-4F Phantom II WTD 61 “Flight Test” kit. Actually it took around 35 hours to be made. I just wanted to share its pictures to you too . The ICE Phantom is a major upgrade for the F-4F, and finally gives the aircraft a BVR capability with its APG-65 radar and AIM-120 missiles. Nice model of one of my favourite subjects, and I was very pleased with the results. Model was built in about 10 days in May and I built it with all restrictions. 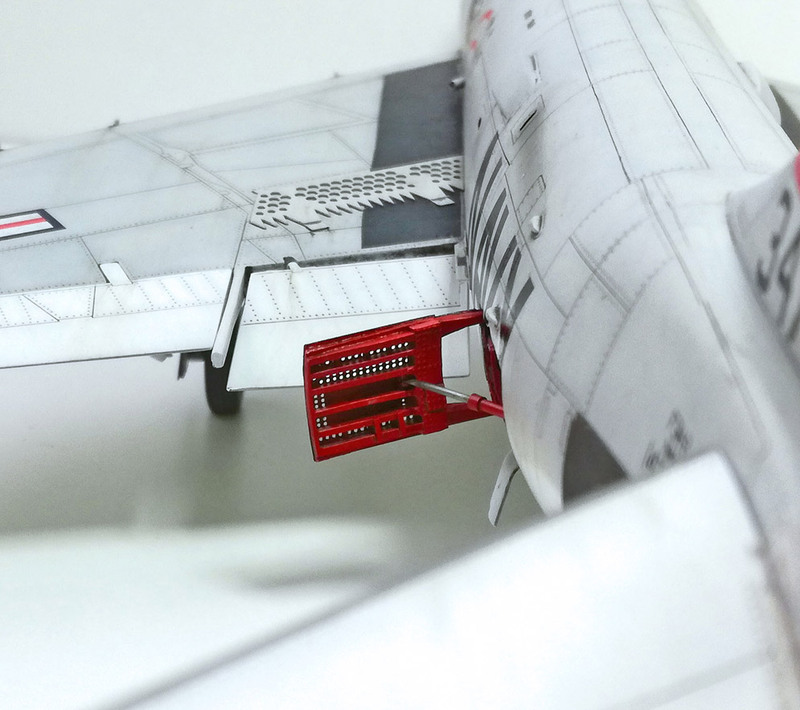 This is one of my own aircraft dioramas – it’s in 1:32nd scale. The F-4J Phantom is Tamiya’s lovely model of the US Navy variant. The scene depicts an F-4 of VF-151 “Vigilantes” onboard USS Midway CV-41 circa 1979 about to be prepared – flighted etc, before being launched on a CAP mission. This is the Tamiya 1:32 kit, which is starting to show its age, not sure why they include the screws for fitting, but anyway, she went together rather painlessly. I used resin ejector seats and engine cans, with quite a lot of Eduard brass in, the pilots were from PJ productions, again my thanks to Jenifer @ JS miniatures for the lighting rig, and programming the chip. Main decals were from the colourful F-4J Phantoms, very nice, more than could be said for the kit decals, they were dreadful, and I had to delve into my spares box, good old spares. The armaments were Eduard but only the Sparrow and Sidewinders, I was going to use the Eduard kit on the bombs but the kit ones worked nicely. She was all painted using Tamiya paints. Here is another of the stunning pieces by Hong Hwan Jang. Some incredible weathering on show here. Note the incredibly subtle airbrush work to get that authentic US Navy low-vis finish. Simply inspirational work. Thanks Hong Hwan. This is the beautiful1/32nd scale Tamiya kit. It’s almost entirely from the box, the only exception being the Eduard cockpit set. Paints used were a mixture of Vallejo, Xtracryllics and Tamiya. The decals are from the kit and I had not seen them applied to a kit in any scale until I used them on mine. Here’s my Tamiya F-4J Phantom II in 1:32 scale. I spent a long time on the base using mostly AMMO of Mig Jimenez, AK weathering products and you can also see other small accessories like leaves, grasses etc. This is my 1:32 model made from the Tamiya F-4J kit. Aftermarket: Barracuda Studios resin wheels, Barracuda decals and cockpit stencils. Painted with custom mixes of Tamiya acrylics. Weathered with oils and enamels. 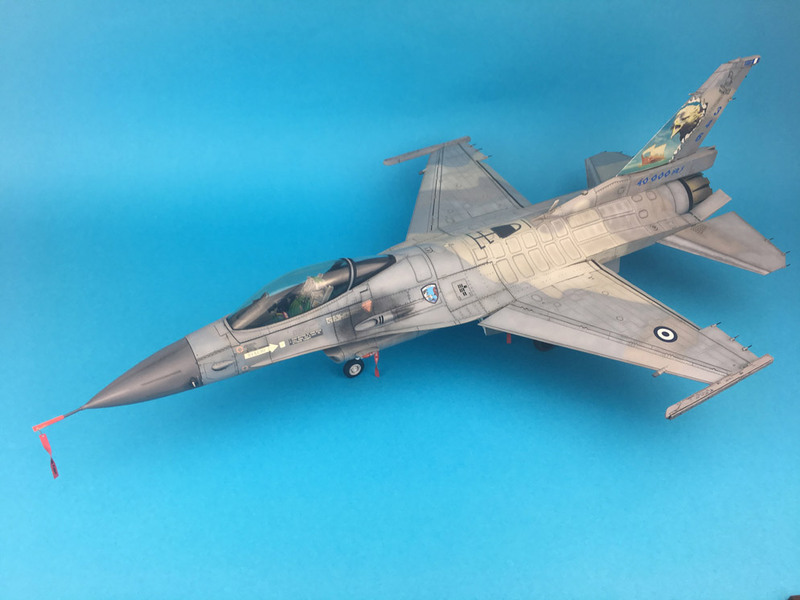 An F-5A from Classic Airframes in scale 1:48 scale, built straight from the box as a bird from the South Vietnamese Air Force during its final days. It is a former Iranian Aircraft being delivered to South Vietnam still in its desert camouflage and used in these colours. The scheme was taken from the book “Fall of the Flying Dragon” from Harpia Publishing. 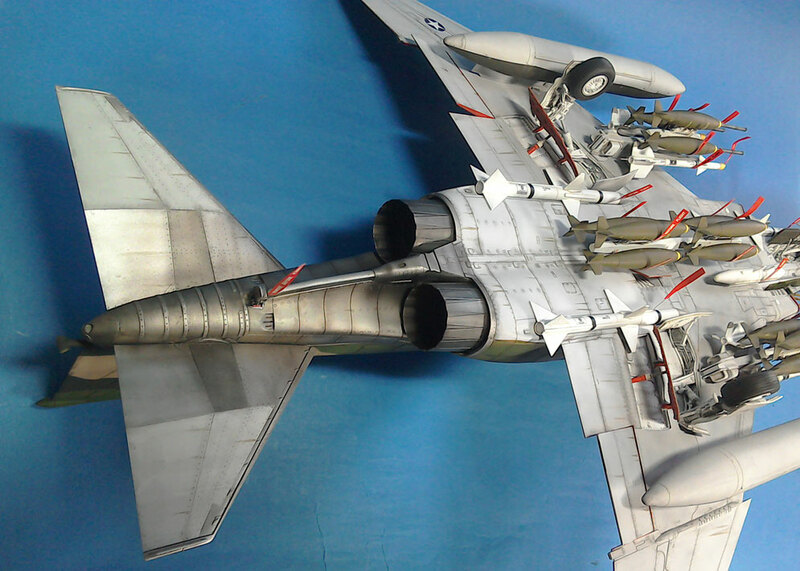 Attached some pictures of an F-5 B I finished this year and also had at our Cologne Pirates stand at SMW (2012). After having a bunch of F-5 kits laying around in my cellar for some years now the release of the wonderful AFV Club F-5 E/F in scale 1:48 triggered me to start an F-5 series; and here is the first one. It is an F-5B in a Canadian Aggressor scheme, which is included in the kit. The kit is no longer available, as Classic Airframes unfortunately disappeared from the market last year or so. Whereas the basic layout of the kit is more on the basic side, the resin parts included really make the difference and make effectively almost as good as the new Kinetic kit. Assembly took some dry-fitting of the parts, especially the resin parts. The colours are rather odd, but exactly that makes the difference of the scheme. I used Xtracolor paints: X39, X107 and X133. After all the work invested was honoured by a medal from the folks from IPMS Winnipeg at SMW 2012. Thanks! Here is another of my recent Kinetic builds. 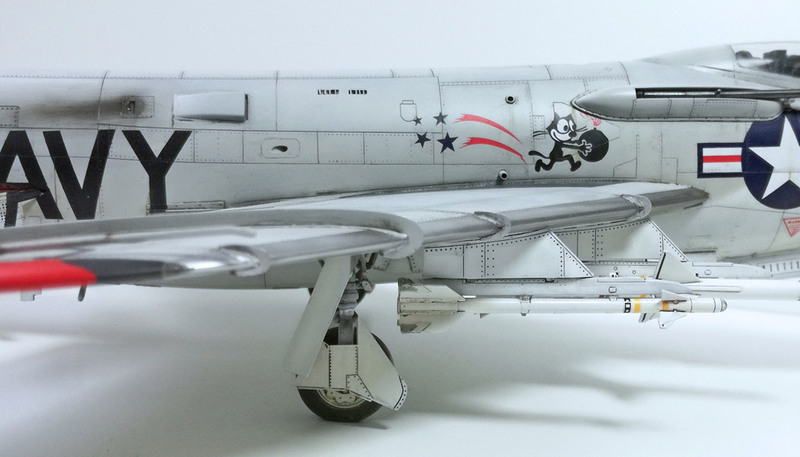 This is the 1:48 F-5B in VNAF markings. The mechanism to open/close the canopies were completely scratch built. A pair of resin ejection seats and photo etch mirrors were the only aftermarket parts I used. The model was painted with Hataka paints from the orange lacquer based range over a black primer from Alclad. Again the kit decals are very good and gave no problems at all.